A large shrub that may be trained into a small tree. Upright spreading branches, form a rounded crown. Gorgeous purple leaves are especially stunning when backlit by the sun. 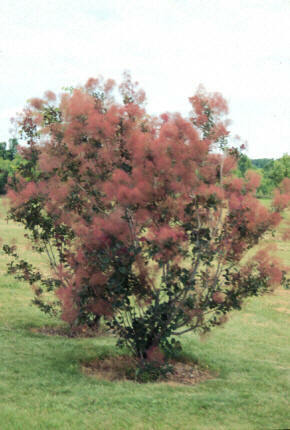 Produces clouds pinkish, airy flower clusters in early summer that appear like puffs of smoke. Nice fall color – a mix of red, orange and yellow. Mature Height: To 15 ft. Mature Width: To 15 ft. Soil:. Prefers moist, well-drained soil, but very tolerant of many soil type and conditions. Quite drought tolerant once established. Comments: A tough, easy to grow plant that may be used as a specimen or part of a mixed border. Excellent for color contrast. We deliver and plant these trees. Most of our planting projects are in Western Washington: Blaine, Bellingham, Everett, Edmonds, Mukilteo, Shoreline, Bothell, Seattle & the "East Side"--Bellevue, Woodinville, Kirkland, Issaquah, Sammamish, etc.--Renton, Kent, Federal Way, Tacoma, south to Olympia and all points in between; plus Leavenworth & Wentachee. Further away, people often come pick up the trees here at the nursery and arrange for local planting. Please see the "Advantages" section below for more information about our planting services and our company. From our Snohomish, WA location, we deliver and plant trees statewide. We sell retail & wholesale, for residential and commercial projects. Sorry, we only do business in the State of Washington. We are a tree farm, not a retail nursery. Most of the trees we sell have been grown right here in Snohomish at our 60 acre tree farm. Buying directly from a grower gives you fresh trees, great selection, and low prices--you maximize your purchasing power! 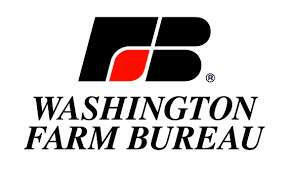 For more information including photos of our farm and growing fields, click here. 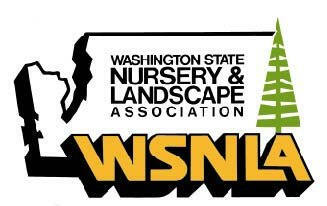 We specialize in Privacy Trees for screening--no other nursery in Washington State has our combination of a wide selection of privacy trees grown locally, many years' experience in "what works where", professional planting services, ongoing support, and thousands of satisfied customers. We have privacy trees that are not available elsewhere. Our "Hedged Privacy Trees" are a good example: For years we have been pruning some of our Privacy Trees into tall, narrow hedges. "Instant Privacy" in a narrow form. No one else in the Northwest has anything like this. Click here for more information. 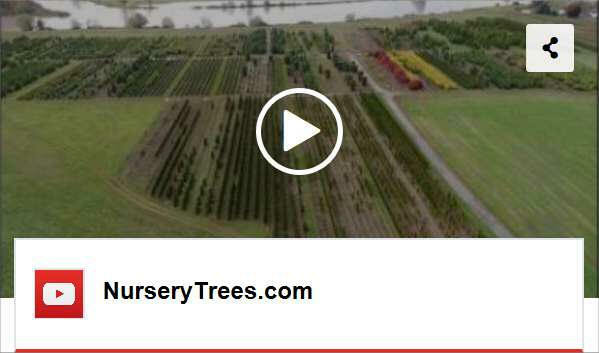 You can see our hedged and natural privacy trees in our beautiful 8 minute YouTube Farm Video. We also have a nice selection of Ornamental Trees, with many of our trees being on the "Great Plant Picks" list for the Pacific Northwest. We don’t require any money “up front”—you only pay when the job is completed (unusual exceptions to this are large/special projects or lengthy “holds” on trees). Be careful of contractors asking for “up front” money; they might not come back! We pride ourselves on our Customer Service—real people answering the phone. We have an "A+" rating with the Better Business Bureau (their highest rating), are an Angie's List Super Service Award winner, have excellent reviews on Yelp, Google, etc. and a 100% satisfaction rating with eBay. We’ve been in business since 1995 and have a dedicated, experienced staff, most of whom have been with us for many years. More information To hear Ed Hume interview our Manager on KOMO Radio's "Ask the Experts" gardening show, click here. We are a registered Washington State contractor (License Number: NURSEL*956J1). More information Be sure to hire a registered contractor -- to go to the Department of Labor & Industries website to check a contractor's registration, click here. As it says there: "Unregistered contractors carry no bond or insurance to protect consumers. Consumers can face serious issues if anything goes wrong on a job." These liability risks are in addition to fraud, poor workmanship, worthless warranties, etc. "Michael, I just wanted to pass along a note to tell you how thrilled I am with the trees. The effect they have brought to our new courtyard in the front of our home here in Seattle has exceeded my expectations!" Chip Hanauer, Hydroplane Driver--Click Here to see his project. See our Trees Growing in the Fields! with many of the trees identified. Click here.